Hello again! I was planning to get my Project Use It Up for January up next but I saw this seasonal challenge come up on Youtube the other day and thought I would join in. 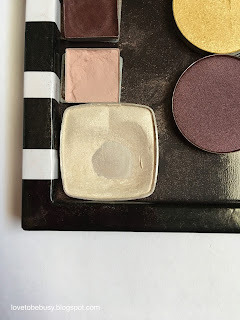 I like to participate in at least one seasonal challenge at a time because it encourages me to use up more products, especially makeup that I don't usually put in my Project Use It Up. So, I'm going to get my intro up for this project and then you'll see Project Use It Up in a few days. The title of this seasonal challenge is Sweet on Project Panning and it is a large collaboration on Youtube between many who project pan. If you search for the title of the project, their videos will come up (little hint, I always sort by upload date so I get the most recent ones). The challenge runs from January 1st until February 28th. You are to pick 5-6 products with the goal that they have some sort of sweet or candy theme. 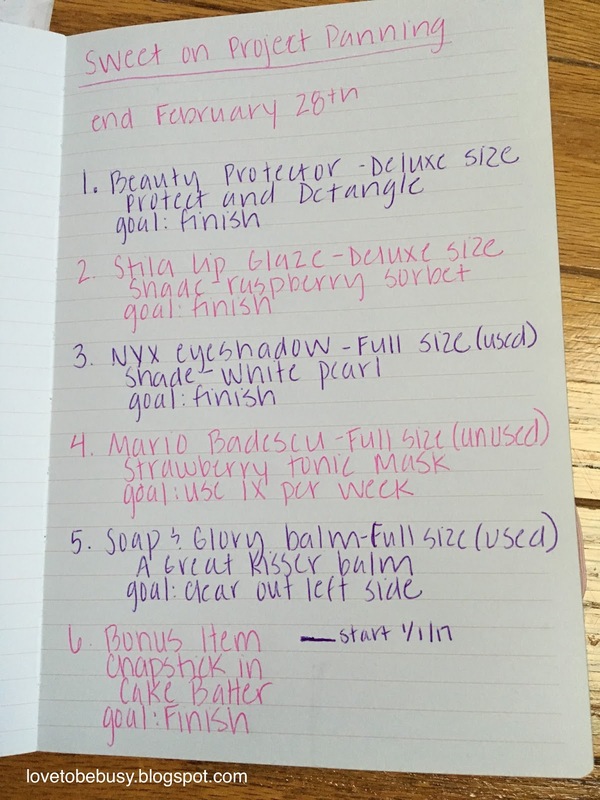 I thought I would start by showing you the page in my beauty notebook for this project. 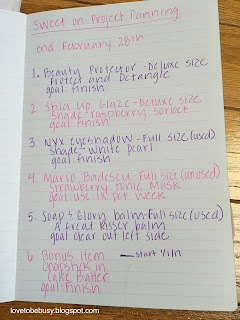 I have listed out all the products with my goals for the project. For the one item, I also left room for a progress marking at the bottom of the page. Adding a goal for each item is something new I decided to do. 1. 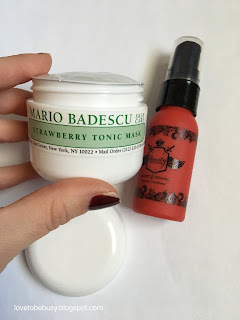 Mario Badescu Strawberry Tonic Mask - I am including this mask because it smells like strawberries. As of the start of the project, I haven't even opened the mask and it is a full size product. I know I won't use the whole thing but my goal is to use the mask at least once a week and see how much progress I can make. I am really bad at using masks so remembering to do it once a week is a good goal for me. 2. Beauty Protector Protect and Detangle - This is included because it smells like cotton candy. This product is also unopened but is a deluxe size. My goal is to finish the product by the end of the project. 4. 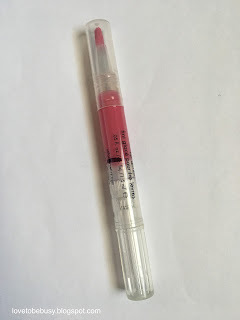 Stila Lip Glaze in Raspberry Sorbet - Since it is pink and the name is ice cream, I thought it was a lip product to include. This is a deluxe size lip glaze and I can usually finish a full size in a few months so I hope to finish this one in the two months that the project will last. 5. 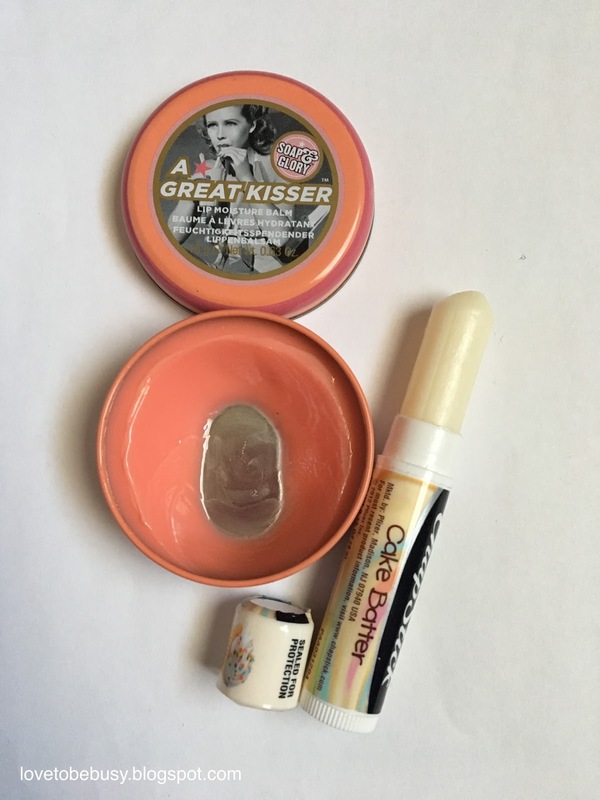 Soap and Glory A Great Kisser lip balm - This is included in the project because it smells like peaches. My goal is to clear out the left size of this tin. I would like to finish more but it takes forever to use up a tin like this so I'm hoping the left size isn't too optimistic. I have had this lip balm a long time and it needs to get finished up this year. 6. Chapstick in Cake Batter - This smells like...cake batter (who knew? :) so I thought it was a great item to include. I use this every night before bed and a full size chapstick usually takes me 3-4 months to finish when I use it nightly. I don't remember when I started this so I don't know if I'll finish it but I should get close. So, these are my six products for this project. If I can hit my goal on 5 of the 6, I'll call it a success. I will do one update at the beginning of February, unless I'm seeing a lot of progress for 2 week updates.